An exposed beam ceiling consisting of hand-hewn, solid white oak timbers gives a tremendous amount of character to the breakfast room that’s under construction in this English cottage style home located in The Retreat at Kennesaw Mountain. It is yet another feature that is not seen in homebuilding these days. There were absolutely no nails used to put this ceiling together, with the exception of the end units being attached to the framing of the home itself. It is a mortise and tenon assembly. Isaac Tate was the carpenter that put this mortise and tenon masterpiece together. 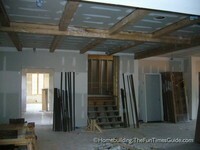 Read on if you would like to see more photos of the mortise and tenon joint exposed beam ceiling. Wikipedia explanation of mortise and tenon joints. If you find this article interesting, you may want to check out the whole series of posts on this English cottage style home and all of the beautiful craftsmanship and materials that go into constructing it.